Previously unattainable by those outside its home-country, British audio company Orbitsound has a follow-up product to last year's T12 soundbar, the T14. Created by eccentric British musician Ted Fletcher (who's worked with Elton John and The Who), it'll cost $600. Full details are below in the press release, but in case you're not familiar with this spatial stereo technology Orbitsound's products use, it basically eradicates the need for a "sweet spot," as it beams the audio out around it, in a pseudo-surround sound style. It's not for everyone, but I really liked how it worked with the T12. CES, Las Vegas, USA, 1600 PST, 4 January 2011: Acclaimed British audio technology brand Orbitsound is proud to announce the T14 soundbar, its first global launch and its North American debut. Featuring groundbreaking ‘industry first' audio technology and wireless capability, this powerful, class leading sound system will bring cinema-quality sound into the home. The T14 prototype will be showcased, for the first time, at CES Unveiled in Las Vegas. 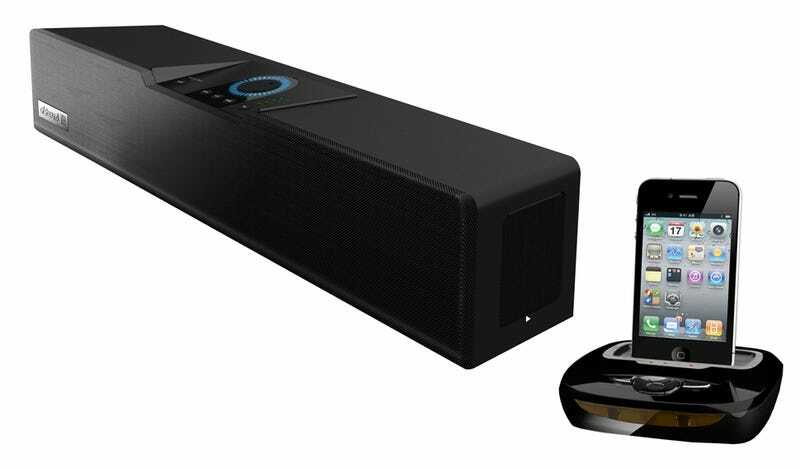 Since its revolutionary spatial stereo technology was unveiled at CES in 2008, Orbitsound has gone from strength to strength and is currently experiencing unprecedented sales of its T12 soundbar product through stores in the UK. Orbitsound is confident that the launch of the T14 will help to replicate this success in North America and other global markets. The stunning T14 stands apart from other sound systems thanks to Orbitsound's now renowned patented spatial stereo technology where, unlike ordinary stereo, there is no need to be in the ‘sweet spot' to get the full effect. The T14 also features another industry first; a studio class amplifier design that has been eight years in development within the company's R&D HQ in the UK. The amplifier senses acoustic conditions and the performance then automatically adjusts itself seamlessly to the room and acoustic environment. There is nothing to set up and the result is a wide audio response and fantastic clarity and consistency across all types of sound and music. Orbitsound's new T14 also features wireless network streaming. This allows users to broadcast their music directly to the device without the need for a transmitter or wires via a remote ‘o-dock' for iPod or iPhone. The o-dock also features an aux input for wirelessly connecting a TV, PC or laptop to the T14. This effectively provides a flexible and high fidelity entertainment solution that is simple to use and without complex wiring and connections. The team behind Orbitsound includes Ted Fletcher, a former musician and renowned audio electronics designer, who has previously worked with Joe Meek, The Eagles and Elton John. Former investment bankers Harvinder Hungin (Executive Chairman) and John Cameron (COO) are passionate about business and have proven successful across several sectors. Harvinder Hungin comments, "Orbitsound is poised for substantial growth in 2011 with ambitious expansion plans for North America and beyond.' Hungin continues, ‘Our game changing, patented spatial stereo technology embedded in the new T14 soundbar delivers high definition, stunning sound to accompany the high definition pictures of the latest HD and 3D TVs. Its state-of-the-art wireless connectivity also removes the issue of clutter, often associated with many traditional 5.1 systems. The T14 is essentially the quintessential modern, powerful home entertainment sound system for contemporary living." The T14 features a high gloss black lacquer finish and has the additional benefit of being wall mountable. Featuring six 2.5 " full range high fidelity drivers, the amplifier power is 120W RMS and the main unit comes with a wireless-linked subwoofer with integrated digital amplifier. The T14 also includes both 3.5mm stereo & RCA analogue jacks and inputs for the latest digital TVs, MP3/MP4 players, laptop & desktop computers and games consoles. The stylish remote control unit controls all playback options and menu functions as well as volume, source and tone. The Orbitsound T14 soundbar will cost approx. $600 and will be available globally in Q3 2011. For more information about Orbitsound, visit www.orbitsound.com.